A happy accident: Nutella pudding. How does someone accidentally make pudding? Well, it wasn’t totally an accident, at least the pudding part, but stay with me. In December, I typically buy and use lots of cream in my baking projects; I had a little left over that needed to be used, pronto. A week ago Saturday, I bought some really nice local organic whole milk to make the bechamel for a lasagna, and I had some of that left, also needing to be used sooner than later. What to do with an excess of good-quality dairy products? Make ice cream, of course. And which ice cream have I been meaning to make for three or five or so years, since I first learned of it from a friend? Why, Nutella ice cream, of course. And so I set out to make Nutella ice cream. I didn’t want to “waste” any eggs, so I decided to use a non-custard recipe I found with only five ingredients: milk, cream, sugar, Nutella and vodka. (I wasn’t sure why the vodka was there and blame it for the freezing problems– an alluringly simple recipe can blur common sense.) Oh, the shame. Don’t cut corners on Nutella ice cream, faithful readers! It will only end badly. After an overnight in the fridge (ensuring that all ingredients were properly chilled), and the manufacturer-recommended time in my ice cream maker (with a fully-frozen bowl…), and then some extra time in the ice cream maker… I had soup. Not an ice crystal to be seen, and certainly not anything resembling ice cream. I was sad and frustrated, mostly with myself for taking a shortcut that rang warning bells from the start. I had an expensive mess on my hands, ingredient-wise, and I vowed to turn it into something edible. I thought that I could probably make a pudding. In a saucepan, whisk together the flour, sugar and salt; add 1/2 c. of the cold milk to make a thick, syrupy paste. Slowly whisk in the rest of the cold milk, a little at a time, until the mixture is smooth. Heat on medium, whisking often, until it thickens noticeably, about 10-15 mins. Be patient; you will have better results if you hold it under the boiling point. 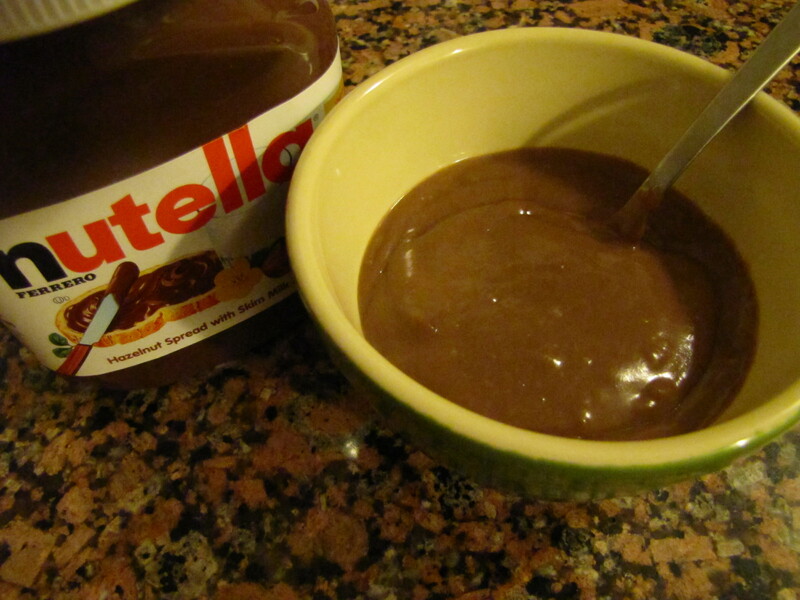 When the mixture starts to steam or bubble a little, stir in 1/2 c. of the Nutella until it melts. Carefully temper the eggs by adding a few tablespoons of the hot mixture into the lightly-beaten eggs while whisking constantly. Don’t stop, or the eggs will cook. Immediately return the egg mixture to the saucepan, whisking the pudding constantly until the eggs are incorporated. Cook over medium heat for 2 mins. (now you want to cook the eggs); remove from the heat and add the remaining 1/4 c. Nutella and butter, stirring to melt, then the vanilla. Place a piece of waxed paper or parchment directly onto the surface of the pudding to prevent a skin from forming. For best flavor, cool before serving. yes ma’am! I have some good ones, though I don’t make a lot of ice cream in the winter. I will dig out my mint chocolate chip recipe (so easy!) and the pumpkin maple one I made a few years ago that was awesome. I plan to keep trying on the Nutella recipe, just with a custard base next time! I heartily, loudly, strongly recommend The Ultimate Ice Cream Book by Bruce Weinstein: lots of flavors and some bases you can add on to for fancier fare. Ice cream machines are fun.